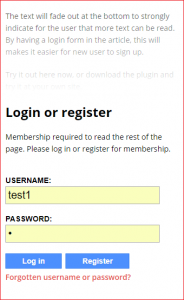 This plugin puts a login/registration form in your post and pages. The user can create a read-more login form by putting a short-code in the middle of the article. The text will fade out in the bottom, indicating for the user that more text follows. To read the rest of the article, the user must log in. The remaining text will load into the page once the user has logged in. Copyright © 2019 Read More Login. All rights reserved.